Distributed Ledger Technology (DLT) is in the news, and ways in which governments and businesses are looking to use this technology are always evolving. In government, we are committed to cost-efficient solutions that provide greater transparency while providing a better service for members of the public. We also have an interest in the wider development and adoption of technology to build a stronger, more competitive economy. And although government is (in most cases) not responsible for such innovation, it does play a critical role in creating the right conditions for it across the digital economy. A distributed ledger is nothing more than a digital record but, unlike traditional databases you may be familiar with, there is no central data store, nor is there a central administrator. Instead, the ledger is replicated across many different machines in what’s called a 'peer-to-peer network'. A consensus algorithm ensures that each copy of the ledger is identical to every other copy, which is why the dataset can be thought of as a single, shared ledger. Back in January, GoScience published a report investigating how DLT could be implemented within government (as well as the private sector to the benefit of the UK economy). Fast-forward to the end of April and we hosted a fantastic Blockchain Partnership event bringing together government and businesses to explore opportunities to use this technology to the benefit of UK citizens and the economy. GoScience created a video that details the technology behind blockchains in more detail. But in its most basic format, blockchain is a continuously growing record that no one can edit or remove. It’s transparent to everyone who has access. Blockchain is a single example of DLT, in the same way Hoover is a single manufacturer of vacuum cleaners, with its own design and nuances. However, the overarching benefit of a blockchain compared to other methods of storing data is the immutability and transparency offered. Once data has been added to the ledger it cannot be edited or removed. When updates are made they are always 'append' only, and a record of when the update was made, and by whom, is visible to everyone with access. This is due to the way in which data is added. The ledger, or ‘chain’, is made up of ‘blocks’ of data that hold time-stamped transactions. Every block includes the ‘hash’ of the prior block, which means that the most recent block always contains a record of every single preceding block. These linked blocks form the ‘blockchain’. Blockchains are frequently used to exchange assets publicly. In such cases, the asset owners use a cryptographic signature to debit their account and credit another’s, so everyone can be certain that each transaction was initiated by an authorised user. Every transaction within each block is visible to everyone who has access to the blockchain - like having ‘edit’ or ‘view only’ rights to a document. A few weeks ago, the Government hosted an event alongside Imperial College’s Centre for Cryptocurrency Research and Engineering. 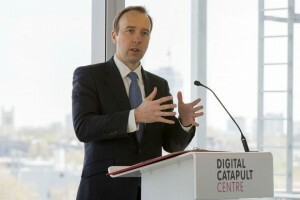 Organised by DCMS and GDS, the event brought together government and business to explore potential uses for blockchain. This event provided a great opportunity to tap into a wealth of knowledge in a laid-back and innovative format. A roundtable discussion and workshops tested ideas for how blockchain could be used within government, with the same principles being carried over to the private sector. For example, to track meat from farm to plate to prevent another horsemeat scandal; to store a car’s service history rather than a folder full of paper receipts; or to share births, deaths and marriage information between different parts of government to prevent excessive administration. Data security and anti-corruption is growing in importance, as more and more sensitive data is stored online. Distributed ledgers offer a potential opportunity for openness and transparency as well as securing data from fraudulent use. Government is often thought to be ‘behind the curve’ when it comes to technology and looking innovatively at storing data and delivering services. Blockchain could well be one tool in an arsenal of emerging technology that could support us in storing and sharing data. Blockchain isn’t a panacea - it won’t be the answer to all our questions - but the opportunities are out there to be explored and tested, to the benefit of the British public and economy. A good idea in principle but in reality it is just too confusing.